A coalition agreement signed Friday afternoon between the Likud Beiteinu and Habayit Hayehudi negotiation teams sees Naftali Bennett's party gain control of a major part of the social-economic axis in Prime Minister Benjamin Netanyahu's new government. 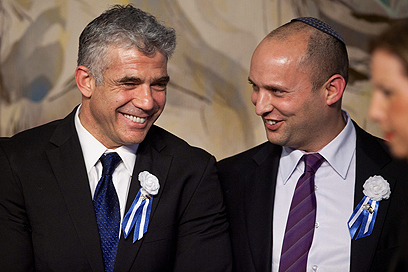 Another agreement was signed shortly afterwards between Likud Beiteinu and Yair Lapid's Yesh Atid party, stating that Lapid will serve as finance minister. According to the agreement, if any minister is appointed deputy or vice prime minister, Lapid will receive the title too. A ministerial committee headed by Yesh Atid will submit a bill for an equal share of the burden to the government within 45 days. Netanyahu is expected to visit the President's Residence on Saturday evening to inform Shimon Peres that he has succeeded in putting together a new government. The agreement with Habayit Hayehudi was signed after a final night meeting between the negotiation teams, following weeks of suspicion and mistrust between the parties. A conversation between Netanyahu and Habayit Hayehudi Chairman Bennett solved the last crisis of the negotiations, after both Bennett and Lapid agreed to give up on the title of "vice prime minister," which was promised to them during the talks. The coalition agreement states that the new coalition members are committed to working together to advance and achieve the government's goals, and details Habayit Hayehudi's roles. "During the establishment of the government, the prime minister will present to the Knesset the composition of his government, which will include three ministers of behalf of Habayit Hayehudi faction: The economy and trade minister, the religious affairs minister, the Jerusalem and Diaspora affairs minister." Bennett plans to make Knesset Member Eli Ben-Dahan in charge of the Religious Affairs Ministry as a deputy minister. The agreement adds that the Housing and Construction Ministry will be in charge of the Israel Land Administration (ILA), and will also be handed to Habayit Hayehudi. MK Uri Ariel will serve as housing minister. "The Israel Land Administration chairman will be (former Minister) Moshe Kahlon, and the parties commit to submitting the required legislation changes to the Knesset in order to put Kahlon in this position. The ILA will remain under the responsibility of the Housing and Construction Ministry." The faction will receive another position – minister of pensioner affairs, which will be given to MK Uri Orbach. Habayit Hayehudi will also have a deputy minister at the Education Ministry. The parties further agreed that Habayit Hayehudi chairman will serve as a member of the ministerial committee for national security affairs (the Diplomatic-Security Cabinet) and in any diplomatic-security and economic forum which the prime minister is part of." The agreement also states that Bennett will be part of a ministerial team established to promote the peace process with the Palestinians, which will be headed by Netanyahu alongside Justice Minister-designate Tzipi Livni, Defense Minister-designate Moshe Yaalon, Finance Minister-designate Yair Lapid and the foreign minister. Bennett will also serve as chairman of a subcommittee of the Social-Economic Cabinet for standard of living affairs, economic concentration and competitiveness. "The committee will be established within 30 days after the government's establishment," the agreement states. Bennett will serve as a member of the ministerial committee for privatization affairs and as the acting committee chairman. According to the agreement, "The Social-Economic Cabinet will guarantee the rights of reserve soldiers according to a plan submitted by Habayit Hayehudi chairman, and the committee will be chaired by a minister on behalf of Habayit Hayehudi." Two ministers will serve on the ministerial committee for settlement affairs on behalf of Habayit Hayehudi, and two will serve on the ministerial committee for legislative affairs. A party representatives will be a member of the committee selecting rabbinical judges. Another representative will serve as deputy Knesset speaker. A Habayit Hayehudi lawmaker will serve as chairperson of the Knesset's Finance committee and as chairperson of a special committee for the implementation of the equal share of the burden outline. A new civil service administration will be under the responsibility of a Habayit Hayehudi lawmaker who will be selected by Bennett. In addition, a Jewish identity administration will be established as part of the Religious Affairs Ministry within 30 days from the government's establishment and will work to improve Israel's conversion system. The coalition representatives in the body selecting Chief Rabbinate candidates will be coordinated with Habayit Hayehudi. The agreement says all legislation changes related to religious affairs will be agreed upon by all parts of the coalition. Another accomplishment by Bennett's party relates to the Zionist-religious education funding. According to the agreement, "The government will work to change the state-religious education's budgeting system in a way which will allow a more decent division of the budget between the different population." The coalition agreement with Yesh Atid states that the party will receive five government portfolios: Finance, education, social services, health and science and technology. Yesh Atid will also be in charge of the Knesset's Immigration Absorption and Diaspora Committee, the Committee for the Status of Women and the special Public Petition Committee. The faction will also have a deputy minister in the Social Services Ministry. The agreement also determined that during its first session, the government will submit to the Knesset's approval a bill changing the system of government so that the new system applies to the next Knesset, which will be backed by all parts of the coalition. According to the new government system agreement, the number of ministers will not exceed 18 (in addition to the prime minister) and the number of deputy ministers will not exceed four. There will be no ministers-without-portfolio. In addition the threshold required for a party to be elected to Knesset will be raised to 4% (five Knesset seats). Prime Minister Netanyahu welcomed the coalition agreements signed between his Likud Beiteinu party and Yesh Atid and Habayit Hayehudi, stating that "We will work together in cooperation in the new government for all citizens of Israel." He also promised to work to "strengthen the State of Israel's security and improve Israeli citizens' standard of living." See all talkbacks "Likud signs deals with Lapid, Bennett"